This is a surprisingly creepy and disturbing tale of bugs, dark hallways and marionette dolls. It is a tale of mystery, deception, false appearances and sneaking suspicions. 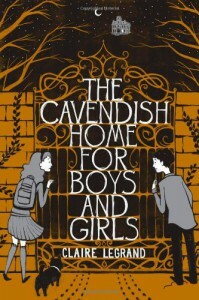 "The Cavendish Home for Boys and Girls" is not a perfect story; but it is a story of perfection, and how we are defined by our own imperfections. Legrand's writing is delightful and whimsical; simplistic and haunting. The plot is constantly building toward something, the mysteries are slowly getting thicker and thicker and leaves tingling sensations all over your skin. As Victoria and Lawrence moves deeper and deeper into the grim truth of Mrs. Cavendish more and more absurdness is discovered. Because this truly is a bizarre book; and adults as well as children will be creeped out by the chilling descriptions of blank faces, moving stairways and helpless gofers. The chapters are filled with disturbing plot twists, and I will never ever feel the same way about butterscotch candy again. The ending is so wicked - so purely evil and so absolutely perfect. The tone of this little book will linger on forever, even when you're trying to escape it.